Jose Fernandez entered play today as one of the most dominating pitchers in baseball, and one of the toughest to hit a home run against. Fernandez 0.65 HR/9 is good for the 7th best in the majors. Ramon CabreraÃ‚Â entered play today with 0 home runs in 100 at-bats in 2016. Cabrera only had 22 career home runs in nearly 3,000 at-bats in the minors. Cabrera ripped a three run bomb in the second inning off one of the best pitchers on the planet. It was his first home run of 2016. 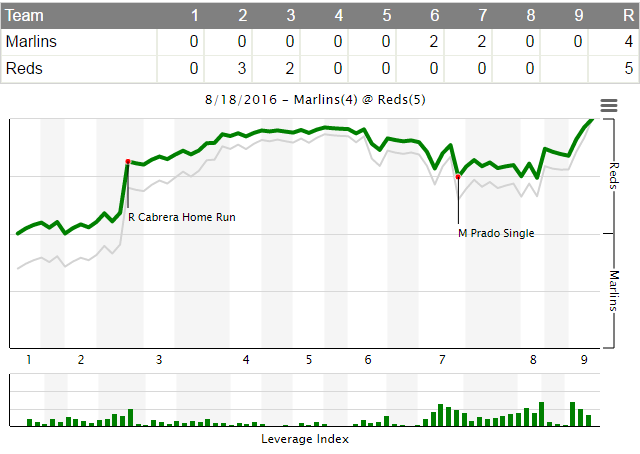 The Reds added two more runs off Fernandez, and chased him after just four innings. The Reds bullpen was shaky, but Raisel Iglesias finished off the Marlins in the 9th for 5-4 win. 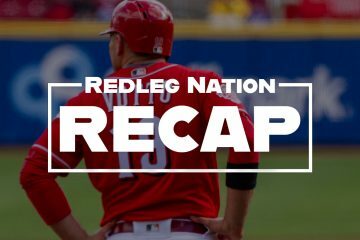 The Reds took three of four from the Marlins, and have now won eight of ten series to begin the second half of the season. 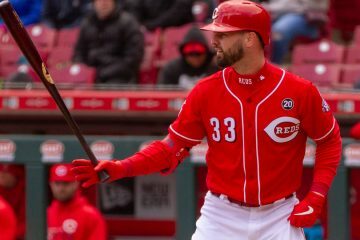 According to FangraphsÃ‚Â WPA statisticÃ‚Â (winning percentage added), the most important play of the game was Ramon Cabrera’s 3-run home run off Jose Fernandez with 1 out in the 2nd inning, giving the Reds a 3-0 lead (video).Ã‚Â That play increased the Reds chances of winning by 22.5% (from 59.0% to 81.5%). Just another nice start from Dan Straily. In his last 3 starts, he has 17 strikeouts and ZERO walks. That is flat out getting it done. Big night forÃ‚Â Ramon Cabrera.Ã‚Â He had two hits on the night, including the big three run bomb off Jose Fernandez (video). That had to feel really good for Ramon. Blake WoodÃ‚Â got out of Jumbo Diaz mess in this 7th inning with a big strikeout. He also pitched a scoreless 8th inning. Joey Votto‘s hit streak might have come to an end at 8, but he did walk twice (once was intentional). Votto has now reached base in 30 of his last 31 games. Votto also made a really nice defensive play in the 1st inning (video). Votto has looked much better defensively of late. Eugenio SurarezÃ‚Â had an RBI double (video), and also made a really nice catch reaching into the stands (video). Billy HamiltonÃ‚Â is so freaking fast. He tagged up from second base on a fly ball to center, appeared to bait Marcell Ozuna into a throw, and Ozuna made a bad throw allowing Billy to score (video). Raisel IglesiasÃ‚Â pitched a perfect 9th inning for his second save. Jumbo DiazÃ‚Â not only gave up a hit and walk in his two-thirds of an inning, but he also had a throwing error. All statistics used courtesy of Fangraphs, Baseball-Reference, and ESPN Stats & Info. All photos are used courtesy of the CincinnatiÃ‚Â Enquirer, and are used by permission. I’m thinking 3 of 4 from the Fish is a good thing. That’s what I’m thinking. Don’t like the choice either there are so many other options that would be better. I guess you didn’t read the post on reds.com where Price said he is not going to define pitching roles . 1 game doesn’t equal a pattern. He was part of the winning solution and I think Price did a fantastic job of managing the pitching element of this game. Yes, I read it. I actually posted a quote about that in tonight’s game preview. There is valid reason to be concerned about Iglesias ending up being wasted as a closer. 2. This quote from Iglesias: Ã¢â‚¬Å“I like coming in from the bullpen. 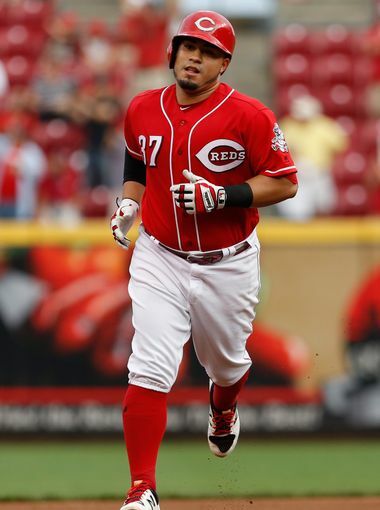 I want to be a closer,Ã¢â‚¬Â Iglesias said this week in Washington, according to interpreter Julio Morillo. I am just going to ignore this problem that is seemingly developing right in front of our eyes and hope it goes away. It’s easy to do when the Reds play as well as they are. Those two statements have scared the crap out of me too…. Iglesias needs to be a starter. Don’t make the same stupid mistake as with Chapman. After the ASB, the Reds’ record sat at 33-57, 24 games below .500. As of today, their record is 51-69, 18 games under .500. Is it just me, or does it feel like their record should have improved a lot more than that given how much they’ve been winning lately? Perhaps, but their record after the ASB is 18-12. Stretched out over a full season, that’s a 97 win pace. Long season, can’t turn it around in one month when you get in that big a hole. We’ve lost 7 one run games in that stretch. Win two of those and 20-10 looks a whole lot better. Yeah, this team needs to go on a ten game winning streak to just get some interest up. But I am glad to see the team winning some series. They’re pretty interesting now, don’t you think? It is almost like once a game is in the loss column, it takes 2 wins to offset it against overall .500 for the season because each additional loss puts the team -1 to .500 from where it was before the game was played. From 33-57 the Red would have to go 48-24 to finish at .500. That would be a .667 rate post ASB. Maybe one of the math mavens can explain it. Perhaps if you looked at it as “net wins.” They just took 3/4….but that is only 2 net wins. They’ve won a few series by taking 2 of 3…..but that is only 1 net win. Since the ASB,they’ve won 18 of 30…..which is 6 net wins. To be on the rate that would get them to .500 for the overall season from the ASB, they would need to have a couple of more wins since they break than they have recorded to date. Reds are now 1 game behind Milwaukee. 1 game to get out of the cellar. That would be an accomplishment. If the Reds stay out of 100 losses and last place, it’s a win considering the smoking crater they were in at the end of May. Those were possibly the worst two months of Reds baseball in my lifetime. I love that Billy play! I like this Dan Straily guy. I attended this first game as a Red. He pitched three innings and did not give up a hit. Kept us in the game. I liked him then and like him now. He’s been really good! Its amazing how he basically gives them 1 good strike to hit and then usually gets them to chase something a little bit low or a little bit high or inside/outside but close enough to get a swing and weaker contact! Straily seems to get it that his job is really a job and approaches it with the same sort of frame of mind many (hopefully most) work a day folks do. He has an honest assessment of his own strengths and weaknesses and studies video of upcoming batters to figure out the same about them so he can pitch to their weaknesses. So is there any indication that working with Price and/or Power found something that has Straily pitching this well. From what I got from some of the articles before about Straily around here they were seeming to say ‘he’s getting lucky’ – is this still the case? That said, it is not unheard of for a pitcher that has kicked around for a few years all the sudden at age 27 to 29 figuring it out and becoming really good. I tend to doubt that Straily will be say Dave Stewart good, but it would be nice if he could keep this up going into next year. His margin for error is small because he can’t over power batters but boy can he pitch.When you consistently do what he has done this year you have to give him credit in a big way.He reminds me a lot of Bronson but on occasion he got bombed and I mean bombed but Straily hasn’t.He will give up some hits but he seems to get that big out or double play when needed.Its going to be real hard for him not be in the rotation is the way I see it.Somebody will have to out pitch him because he won’t give it up. 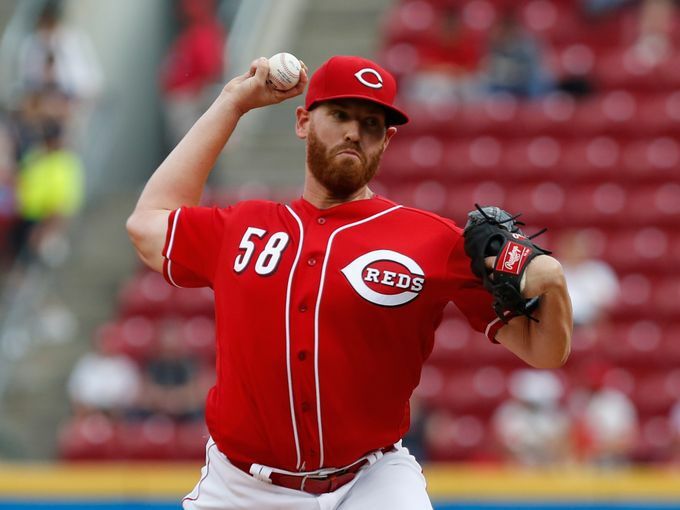 If Straily locks down a back-end starting rotation slot for 2017, the Reds will be swimming in gravy, if the front office can manager the 25-mand and 40-man rosters effectively. One of two of the starting candidates may find themselves relagated to an additional season in AAA rather than pitching out of the bullpen or starting rotation at the MLB level, but this would allow the front office to extend the effective service time for the starting rotation candidates and make the best possible trade using one of their starters to land that bat upgrade they may need and possibly even move Bailey’s contract.